South Korean smartphone giant Samsung Electronics has been sued by US-based data security company PACid Technologies for infringing the American firm’s patents on biometric solutions, according to a US legal resources website and news reports on Thursday. On Justia, a US legal resources website, brief information of the case filed on Friday by PACid Technologies with the Texas Eastern District Court was posted, revealing that the Korean tech titan is involved in another major patent infringement case after about a 6-year-long legal dispute with Apple on design patents. According to the summary of the case, the US security firm accused Samsung of infringing two patents owned by the firm in the US and one in Korea. The patents are related to biometric technologies, including fingerprint, iris and face scanning, which are adopted to Samsung’s flagship Galaxy S models from the sixth through eighth editions. More specifically, the US company is claiming that Samsung breached the patents related to how the operating systems for user verification Samsung PASS and Samsung KNOX work. 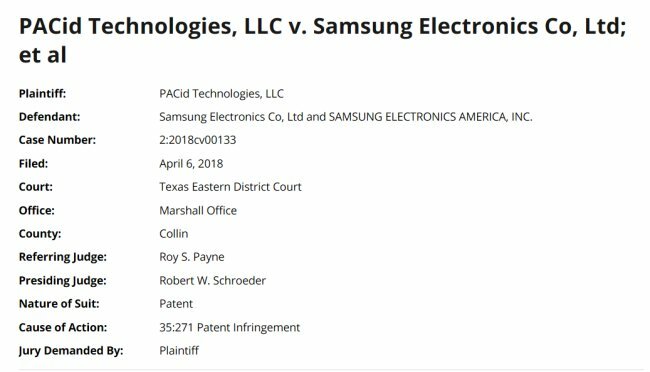 If the US court rules in favor of PACid, Samsung could face up to 3 trillion won worth of damages under the US patent law No. 284, said a report by a Korean newspaper. The amount of damages is estimated by the sales volume of the Samsung devices in the US. If Samsung was aware of the action of patent infringement before the suit, it could be ordered to pay up to three times of the damages per sales unit, the report said. However, some in the industry raise suspicions of PACid’s intention of suing Samsung, considering the company’s obscurity in the market. “We have just learned of the case, and we have no comment on such a legal issue,” said a Samsung official, adding that it is too early to estimate the damages amount. Samsung America will handle the issue by appointing legal representatives as the procedures begin.